It's been a while since I made you salivate/l'eau à la bouche. Miss Manon is just a small corner patisserie in the Marais 75004 at 87, rue Saint Antione and rue Saint-Paul. It's not a high-end 'couture' patisserie but their sandwiches and pastries are delish. So when I headed down rue St-Paul to look in Au Petit Bonheur la Chance of course it was ferme/closed. So many goodies(cafe bowls, old school supplies, stickers) locked away for another hour or so. 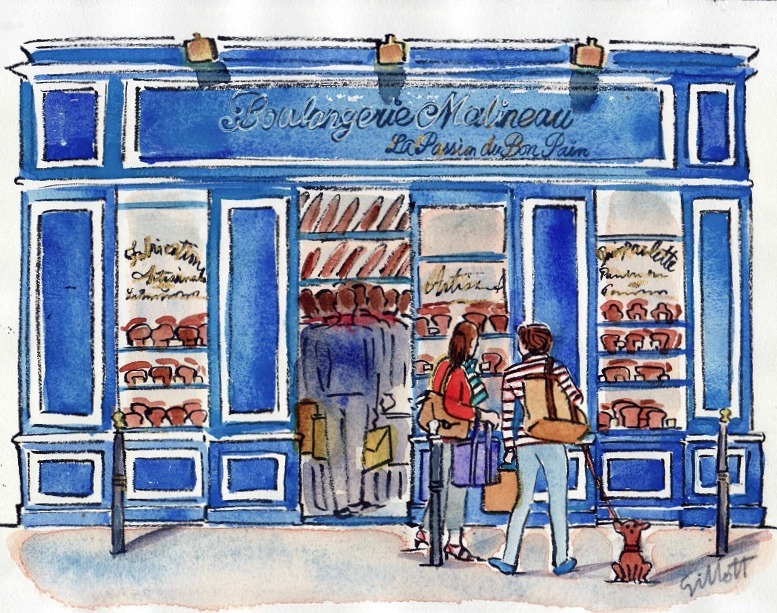 Across the street at #30 rue St-Paul, Bijoux Blues was not closed - perhaps the smallest shop in Paris. Their goodies are just as delish. 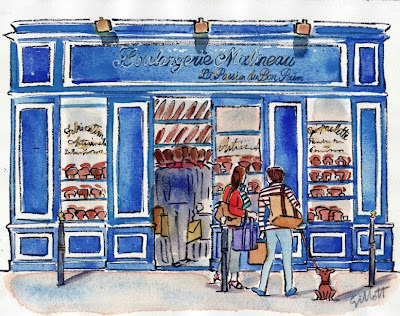 A few doors up blue Boulangerie Malineau has edibles a plenty like caneles waiting for the 4:30 snack bell to go off. EW antiques has captivating windows across the street at #21. Do you know The Red Wheelbarrow bookstore at #22 Mostly English books here and they'll greet you with big smiles. I bought the Discover Paris by Metro. Only to find it's come out here in English! A 'l'indispensable' as the French say when you're charging around Paris. Automatic feed doesn't allow for comments, but once in the while I must visit you here just to say I enjoy your pastries, the streets of Paris, and the red. Mon dieu; coincidence again ~ Popping a strawberry in while opening your post! While I love guides, I really like getting 'up close and personal' with your commentaries and pics on various neighborhoods that I always plan to visit but somehow cannot seem to fit in when I do go; to wit: Rue Cler, The Marais...I could go on...so next time I will go thru your posts laboriously, or you could just write a book! May I add...I save any and all of your posts in a 'file' just to enjoy your paintings ... there's another book for you! I wanted to say that it was in part to your morning e-mails and Vicki's French Essence that enticed me to really look forward to my Paris trip. 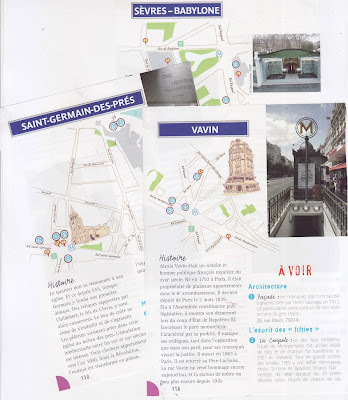 Yes, I had been to Paris 3X before, but this time I was able to relax with my husband, and we enjoyed strolling around, walking through the park, all the way up the Champs E., taking a leisurely ride on the Bateau-bus, and people watching, taking in the scenery, and window shopping. There was no wild frenzy to see all the museums, or, the tour Effiel, and I really enjoyed the city from an entirely different pint of view. We met a lot of very very polite, happy, and respectful young children. We just returned from a 3 week stay in the Marais. I just loved living there. One of my highlights was visiting the home of Victor Hugo (if you go, make sure you get the audio guide). He had the same mistress for 50 years and they shared 20,000 love letters. Dreamy location, too, overlooking the Place des Vosges. Come to think of it, why DON'T you write a book, even a series of books? and do the shops close for their 4:30 gouter? The English bookstore, Red Wheelbarrow, does not close btw. Great photos of the pastries and the shops. I like Bijoux Blues! Love to see all these cute little shops you take pictures of. I love your painting too. Fun post. Last spring in Paris my friend and I had coffee and breakfast treats at Miss Manon's every morning day! It was a great beginning to every day . We are both going crazy seeing your post today! Yes, you made me salivate! & Yes, your book would be nice! Great ,actually! Buzzing around Paris on sugar high and book leaves! Oh yes. Salivate I certainly did. having a friend who has moved to Paris." After reading that, I don't know if I'll be able to wait until gouter @ 4:30. I just received my copy of Bringing Up Bebe. Gonna spend the weekend with it. Well I know where I'm going on Saturday.....merci beaucoup.